The Arctic Coastal Plain of northern Alaska is an area of strategic economic importance to the United States, is home to remote Native communities, and encompasses unique habitats of global significance. Coastal erosion along the Arctic coast is chronic, widespread, and may be accelerating, which threatens defense- and energy-related infrastructure, natural shoreline habitats, and Native communities. There is an increased demand for accurate information regarding past and present shoreline changes across the United States. 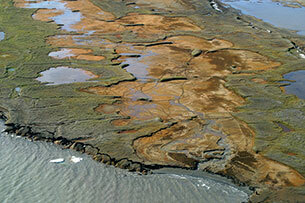 To meet these national needs, the Coastal and Marine Geology Program of the U.S. Geological Survey is compiling existing reliable historical shoreline data along sandy shores of the conterminous United States and parts of Alaska and Hawaii under the National Assessment of Shoreline Change Project (hereafter referred to as the "National Assessment project"; http://coastal.er.usgs.gov/shoreline-change/). A comprehensive database of digital vector shorelines and rates of shoreline change for Alaska, from the U.S.-Canadian border to Icy Cape, is presented in this report as part of the National Assessment project. There is no widely accepted standard for analyzing shoreline change. Existing shoreline data measurements and rate calculation methods vary from study to study and prevent combining results into state-wide or regional assessments. The impetus behind the National Assessment project was to develop a standardized method of measuring changes in shoreline position that is consistent from coast to coast. The goal was to facilitate the process of periodically and systematically updating the results in an internally consistent manner. A detailed report on shoreline change for the north coast of Alaska that contains a discussion of the data presented here is available and cited in section, "Geospatial Data." Gibbs, A.E., Ohman, K.A., and Richmond, B.M., 2015, National assessment of shoreline change—A GIS compilation of vector shorelines and associated shoreline change data for the north coast of Alaska, U.S.-Canadian border to Icy Cape: U.S. Geological Survey Open-File Report 2015-1030, https://dx.doi.org/10.3133/ofr20151030.